In a previous life, I worked as a wind energy developer. It meant lots of long trips to exotic places where people are usually not (at least, not in great or even middling abundance): places like Sweetwater, TX; Minot, North Dakota; Ozona, TX; and Santa Rosa, NM. Don’t get me wrong — these are all lovely places with very kind, welcoming communities. But wherever there is plenty of wind to support industry-scale wind projects, there is typically not much in terms of population. Anyway, I remember vividly one day trip I took to some North Texas county (I can’t remember which one anymore, but it was a very rural, remote area with a lot of trees and, as we soon figured out, not as much wind as we’d hoped) one spring day. The company I worked for had sent over a young intern named Adam from Irish HQ, so as an educational experience and for some company I took him with me. During the long, two-hour drive to the meeting, we somehow got to chatting about artists (musicians in particular), creativity, and the bubbling tension between the need for these artists to make a living and the demand of their fans for free content. This was a post-Napster, pre-Spotify world, when Pandora was just starting to find its audience and YouTube was exploding with illegal uploads of both official and “unofficial,” fan-made music videos. Artists have always, always struggled for respect and an adequate income for their work. Distributing content without artist compensation is a longtime tradition — it’s why copyright law was invented in the first place. But with technology making it so incredibly easy to distribute any creative work on a mass, global scale, it’s become even harder for artists to control their work and earn a living wage from it. If even musicians with vast financial resources and the power and influence of corporate money behind them can’t make money solely from their creative output but must hustle to make themselves into a “brand”, is there much hope for the “independent artist” who would rather spend their time and energies actually making art and not shilling t-shirts and plastic wrist bands out of cramped apartments? I could never convince Adam that artists deserve to be paid every single time their music is downloaded, their film is viewed, and their book is sold. But while the conversation happened nearly a decade ago, it stuck in my head and comes out periodically whenever I read articles like this one, which calls for basically an overhaul of society and more expansive public investment in artists and their art. Despite what I just wrote above about the importance of compensating artists for their work, I’m of two minds about the idea of devoting public funds to support artists. The Depression-era programs put to work thousands of writers, photographers, filmmakers, and visual artists left an astounding legacy of documents, films, and artwork that serve as a rich repository of content about a particularly critical time in American history. On the other hand, the content, while voluminous, wasn’t exactly created solely for the sake of art. As this article carefully points out, “Nothing was published that was not first approved by Washington and the entire process required that the author remain anonymous.” Government money is rarely offered without strings, even today, and while I consider myself fairly liberal, I hesitate to endorse any arts program or idea that relies so heavily on government largesse. Socialist art has rarely produced anything of lasting cultural value and more often than not serves as a propaganda tool. The artist should only ever be beholden to their creative impulse, never to an outside agency with its own agenda. Still, I also don’t think that we can expect the “masses” (who my former political science prof often referred to as “asses”) to suddenly have a change of heart and refuse to download anything without ponying up a royalty to the artist. One program I find appealing is Ireland’s Artists Tax Exemption. Rather than requiring artists to submit exhaustive applications and compete with their peers for a limited amount of earmarked funds — a process ripe with bias and the stifling of free speech and creativity — the program offers a simple blanket benefit to all artists who make money from their work. It’s not a perfect program: the government is still the final arbiter of what it considers “of cultural merit” and thus eligible for tax exemption. But it does strike me as an easier and more liberal means of supporting artists by removing or at least minimizing the burden of supporting oneself through one’s art. Like everyone else in society, the artist must still organize her paperwork and receipts to prepare for filing the appropriate returns, but at least she’s not enduring the soul-sucking business of filling out reams of grant applications, writing one more goddamn essay about why her work should be funded, and gathering reference letters and budget forecasts. I’ve not spoken to Adam since I left the company in 2006, but I wonder what he thinks now, a decade later and 10 years older, about the state of the music industry. Folks wanting unlimited free music have never had it better — I listen to Spotify all day long and have never paid for it. But as a writer who works hard for every word and every page, I’m terrified of what the future holds for creatives who want and deserve to be paid for doing what they love and doing it well. via The Father Of “Getting Things Done”: You’re Getting Me All Wrong | Fast Company | Business + Innovation. Note: Great article about the Getting Things Done philosophy of productivity and mindfulness, and interview with its creator, David Allen. I’ve been a fan for years, ever since I read the book back in 2009, and have been struggling to perfectly implement it in my work and personal lives. This article is making me rethink how I interpreted GTD (despite the fact that I’ve read the book cover-to-cover and listened to the full audio book at least 3-4 times!). I especially enjoy the analogy to Zen Buddhism, a philosophy and spiritual discipline that really resonates with me. Worth a read and won’t take more than 10 minutes to do so. via The Dalai Lama’s Daily Routine and Information Diet | Brain Pickings. 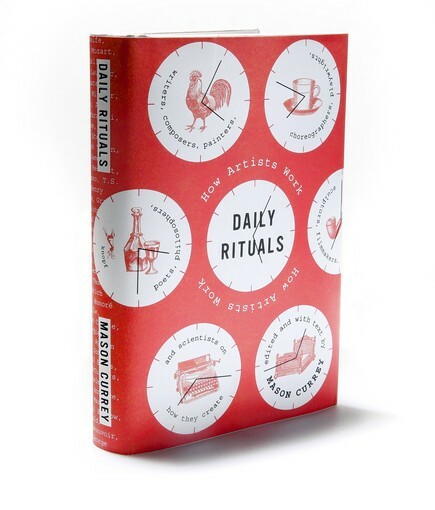 I finished reading Mason Currey‘s Daily Rituals recently. It’s one of those books that you have to read with a highlighter in one hand and a hot cup of tea or coffee in the other. A notebook might be nice, too, but it’s not required. I can’t remember how I first heard about this book (probably from Arts & Letters Daily, one of two websites I must read every single day if I’m going to feel complete before I tuck in at night — the other one being NPR.org), but I’m sure that when it happened, I must have immediately opened a browser tab and searched for it on Amazon. I went to several Barnes & Noble shops over the next few weeks, but not one of them had a copy. I guess I could have called each one rather than wasting so much time and gas traipsing from one to the other, but I like going to bookstores. Bookstores are my Tiffany’s — nothing bad could ever happen to you in there. You get rid of the mean reds, blues, violets, and blacks. Except, of course, if you don’t find what you’re looking for, which was the case in my search for Currey’s book. I wanted to give my local bookstore a chance to make me happy, especially after the disappearance of not one, but all of the brick-and-mortar bookstores in my town last year, but I finally gave in and ordered it from Amazon.com. Once I had it in my hands, I devoured it in two sittings. It’s actually a pretty short, quick read. Currey collected interviews, essays, and vignettes about various creatives — over 200 of them — from Stephen King to Henri Matisse, Somerset Maugham to Twyla Tharp. You can dive in and read a one- or two-page written snapshot of how each creative professional worked, their routines and habits, even their tools. It’s not meant to be a little encyclopedia of artists, and Currey doesn’t really even bother explaining who these notable figures are. If you pay any attention at all to the worlds of arts and literature, you will likely at least have a passing familiarity with just about everyone featured in this book (Louise Bourgeois, Friedrich Schiller, Knut Hamsun, and Maira Kalman, are just a handful of folks mentioned whom I had to look up on Wikipedia), but really, it’s not really necessary. Currey goes into intimate detail with many of his subjects, from Picasso’s habit of sleeping late and rising late as well, getting to his studio by 2pm to begin his work of the day; to Alexander Graham Bell’s own regimen of working around the clock, which he eventually had to modify to take his wife’s pregnancy into consideration. If you’re looking for techniques on how to be creative, or tips on how to call forth the muse when you’re stuck on a paragraph or a blank canvas, you’re better off looking elsewhere. What I got instead, however, was a deep appreciation for the sacrifices artists must make in order to engage in the hard, unrelenting work of creating something: a book, a painting, a piece of music, or a piece of software. Austin-based writer, artist, and blogger Austin Kleon frequently laments the creative’s practice of sharing only finished work with the world and hiding all the messy, gut-wrenching process that made that work possible. Currey’s answer to that was this book, a wide-open door into what artists throughout history have had to do in order to make time and room for the act of creation in their lives. Whether it meant working feverishly around the margins of a day job, or a family’s demands, or crafting a rigid schedule of daily hours, these folks got it done. I have it on my desk now as a reference, right next to a lot of history books and notebooks (and receipts, pens, random Post-Its, and folders), and dip into it frequently. I’m still working on a schedule that works for me and the many things I juggle with on a daily basis (home, work, dogs, volunteering, extended family needs, reading, and writing), and this book reminds me that others with far more demands on their time were able to carve out the space in their lives to make art.